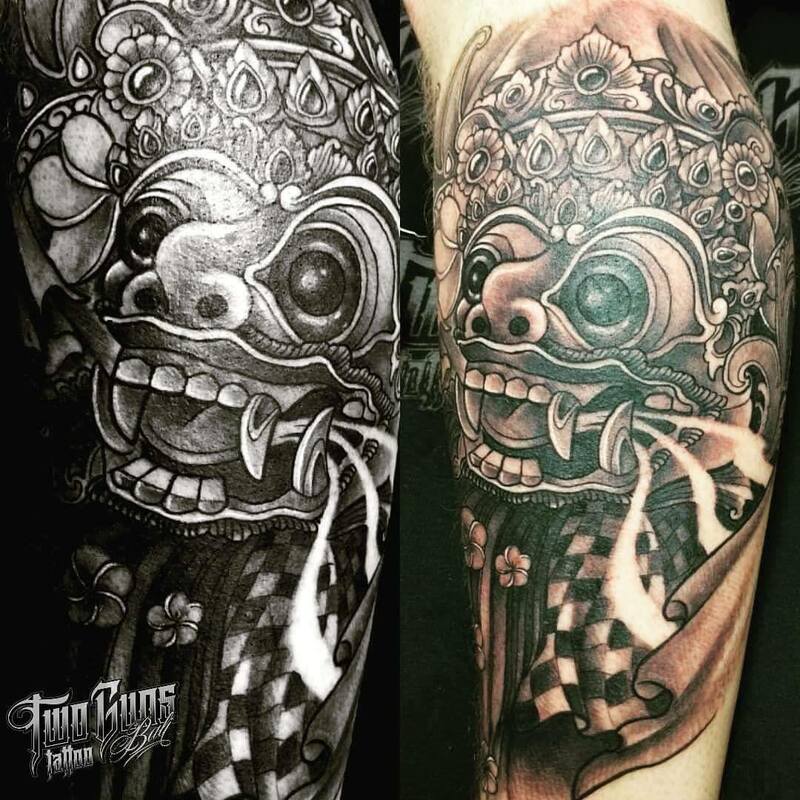 Bali is blessed with beautiful crafts and customs, and Balinese art is world-famous, especially Balinese paintings, woven textiles and statues. 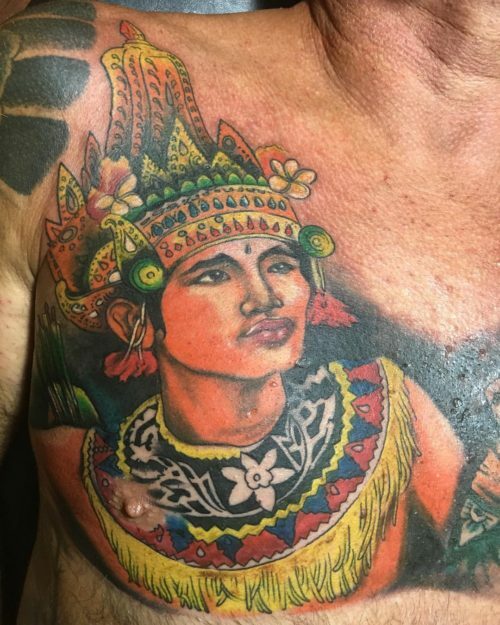 This little island has also become an international destination for getting tattooed, so many people are surprised to learn that tattooing is not part of traditional Balinese culture. 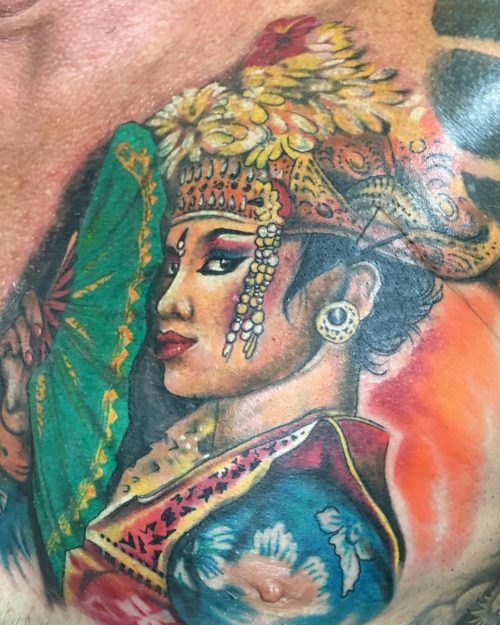 Thanks to globalization and tourism, Balinese tattoos are now “a thing” in high demand. 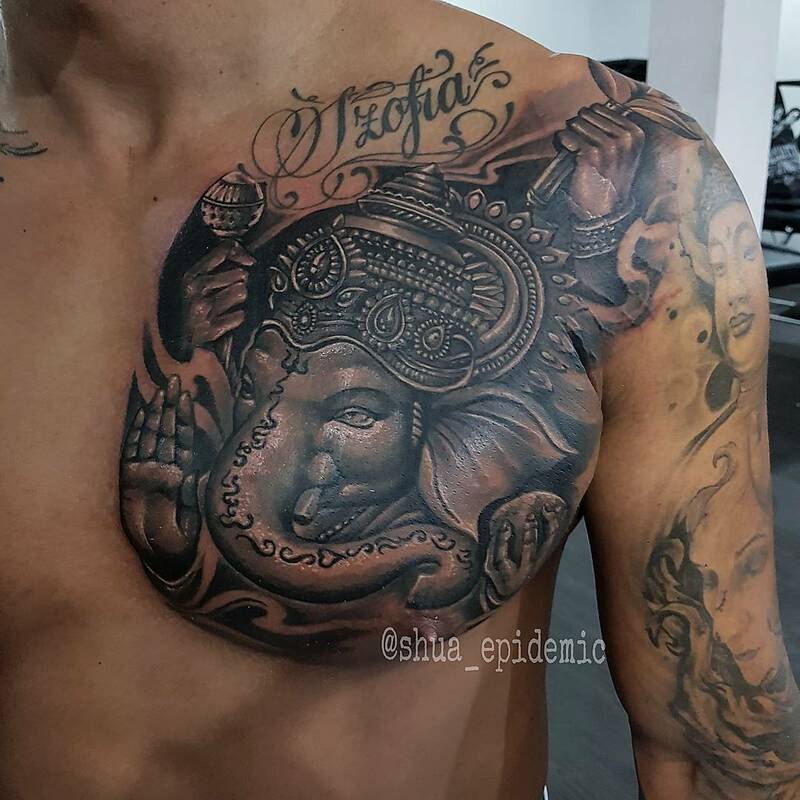 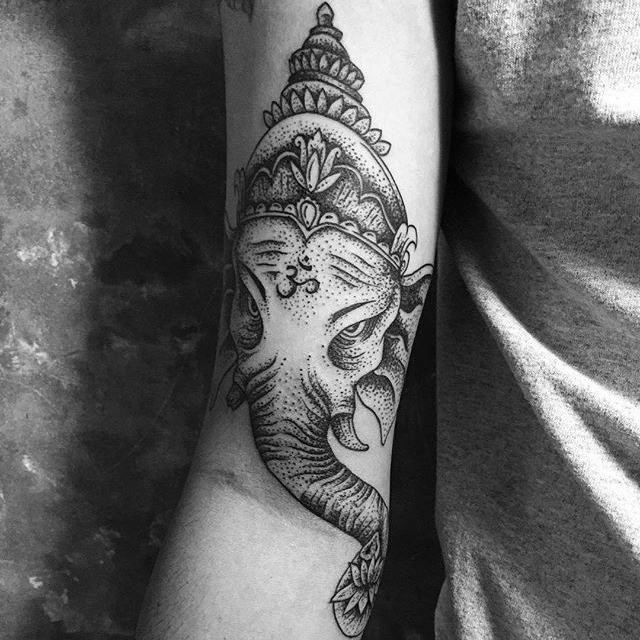 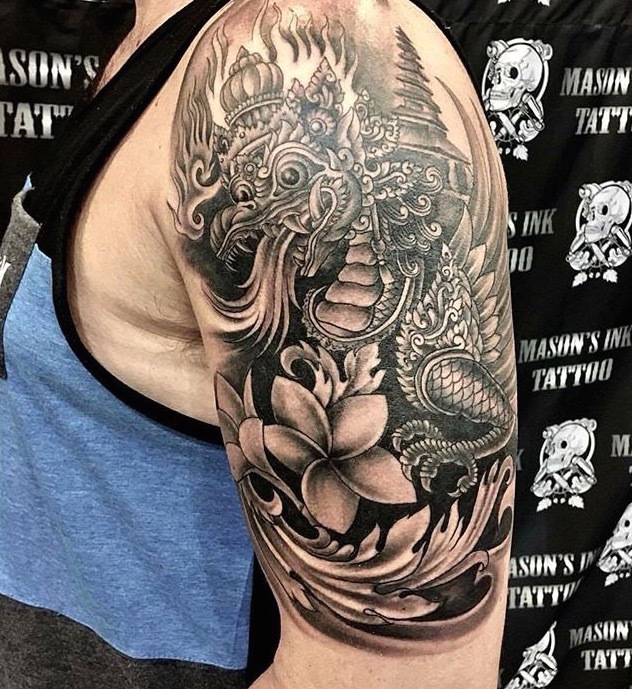 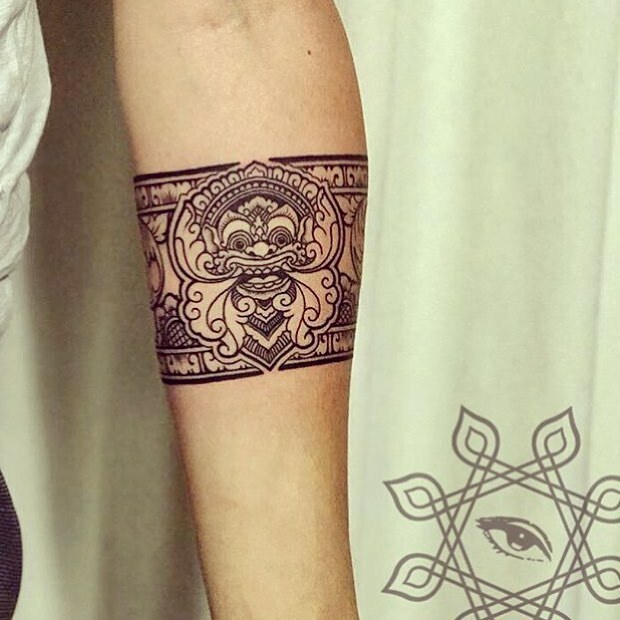 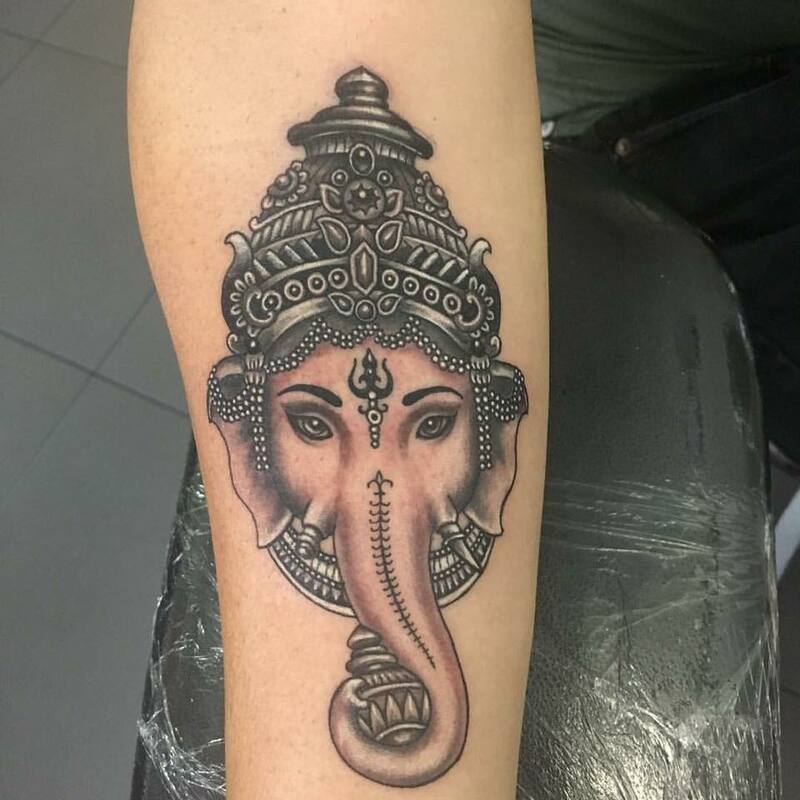 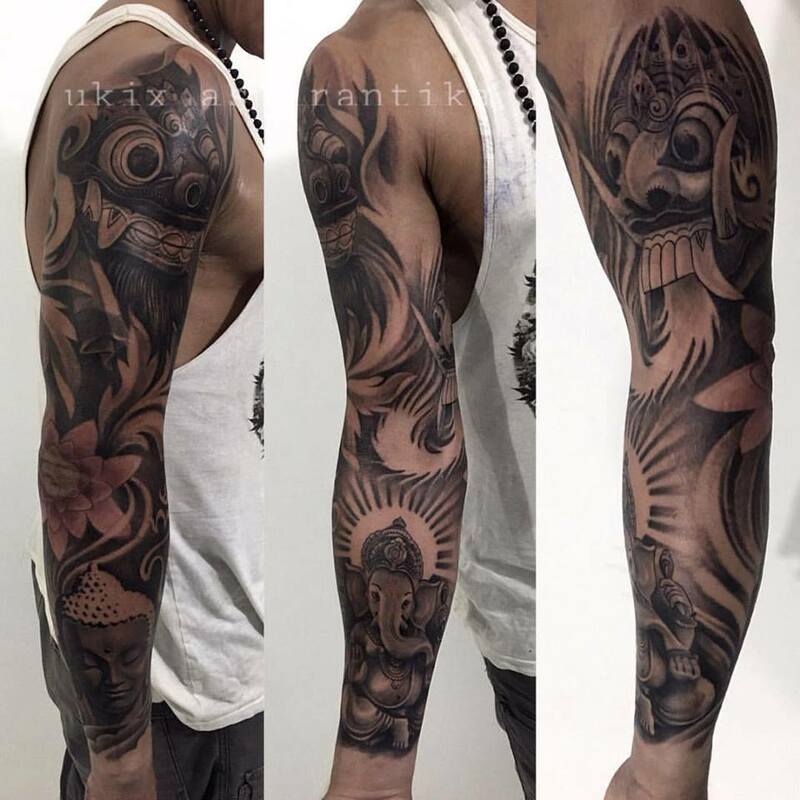 We see a lot of tattoos that look like Balinese stone and wood carvings – striking tattoos of Hindu spirits with floral embellishment and heavy shading and highlights. 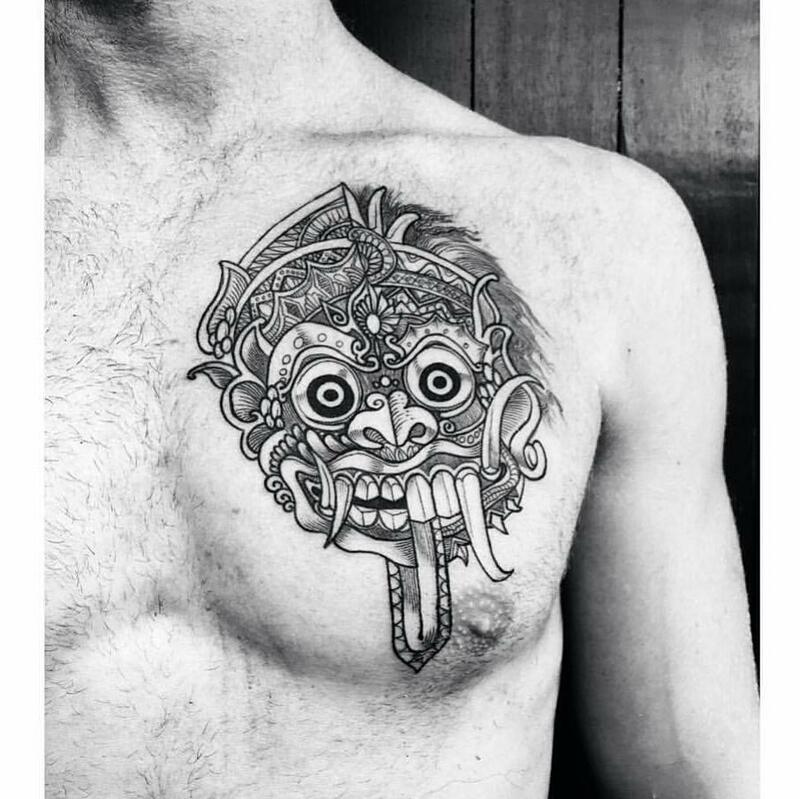 Here are some of the most popular Balinese tattoo designs and examples from the Island of the Gods. 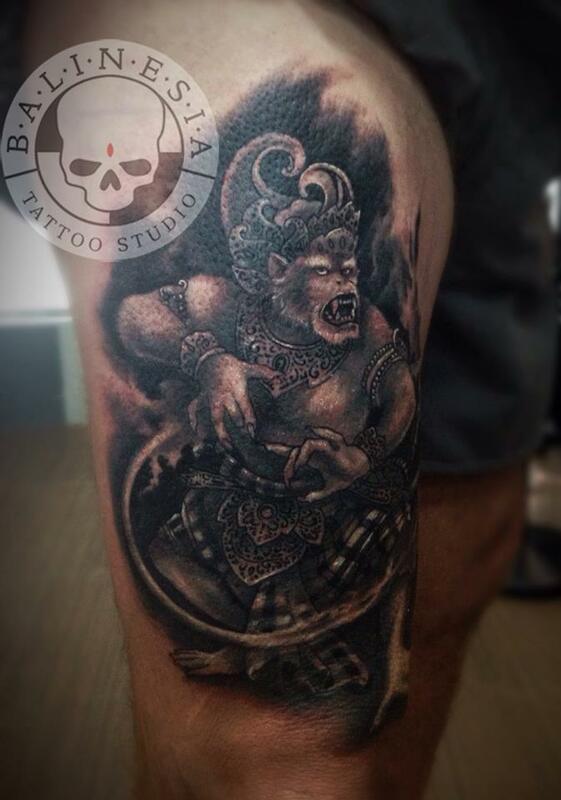 The Balinese Om (or Ongkara), the symbol of God, creation and the universe, is the most sacred Hindu symbol in Bali. 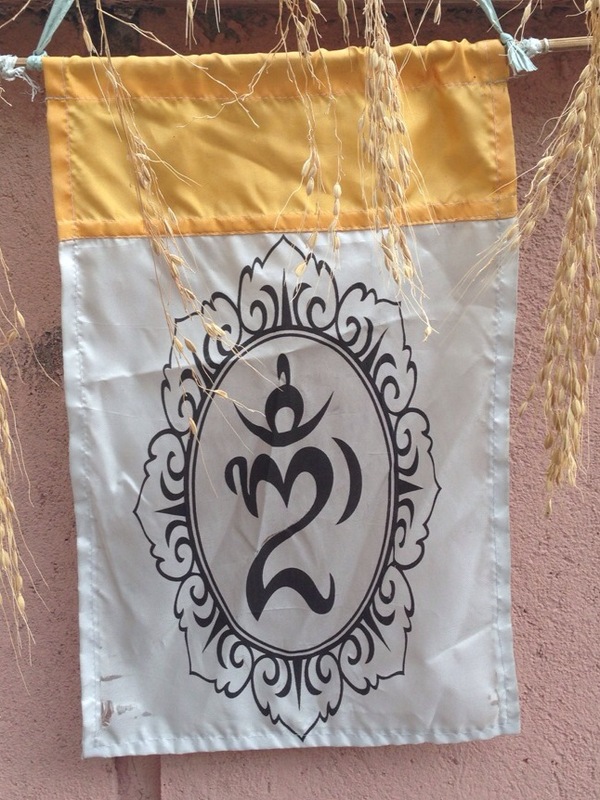 A display of devotion, you can find the Balinese Om symbol at temples, on entrance ways and on flags which are prevalent for the Galungan holiday. 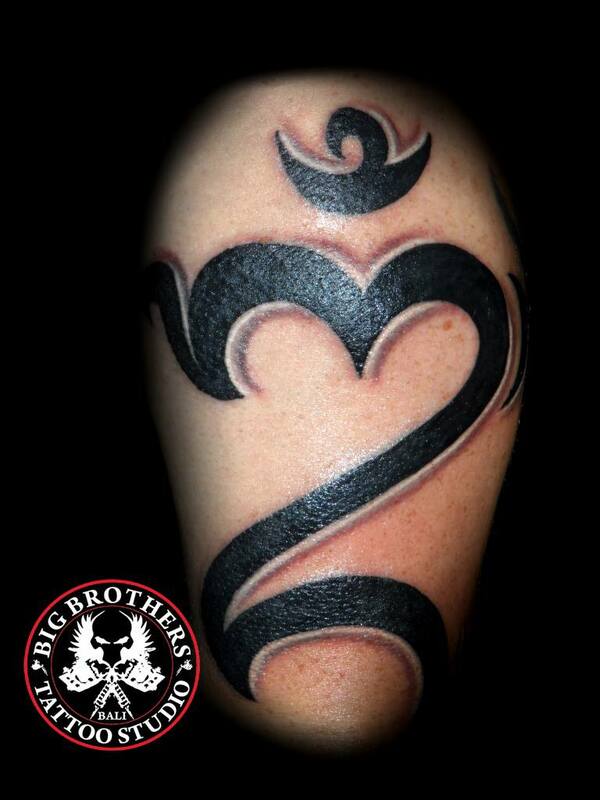 Its shape is taller and more ornate than the Sanskrit symbol of holy trinity. 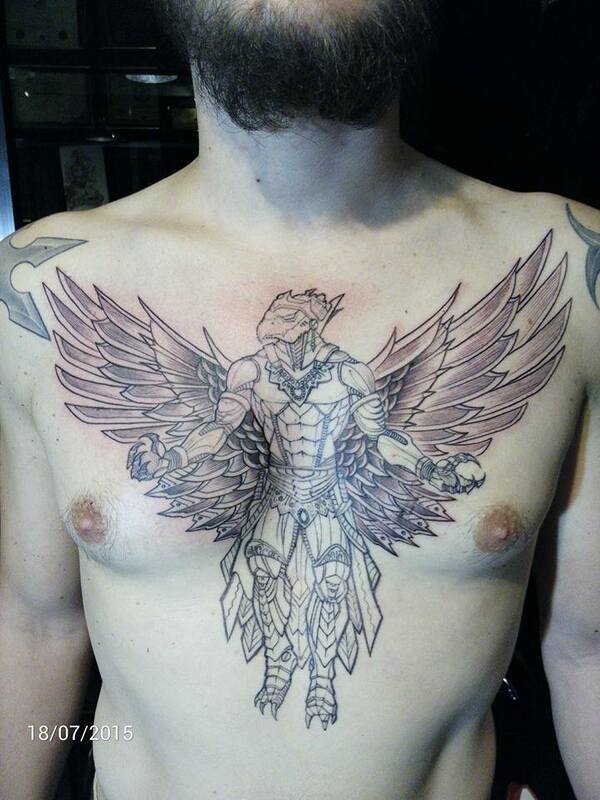 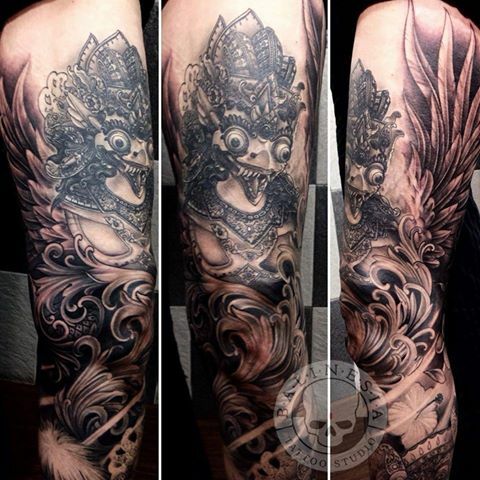 Garuda is the bird-like deity with a strong work ethic and good morals. 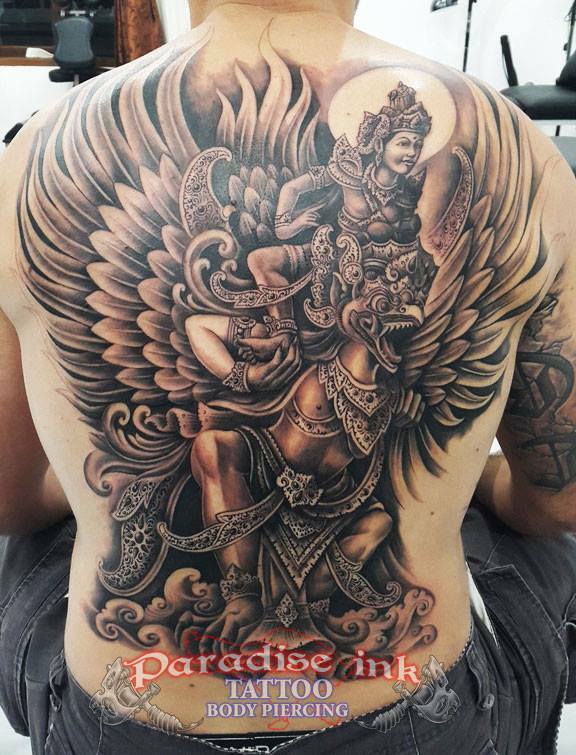 Garuda has massive wings extending from a chiseled human abdomen, talons and the beak of an eagle. 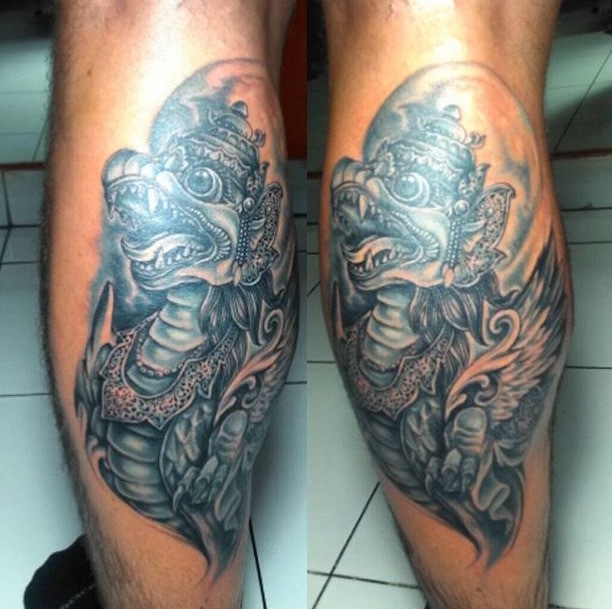 Garuda is a national symbol for Indonesia and the name of its major airline. 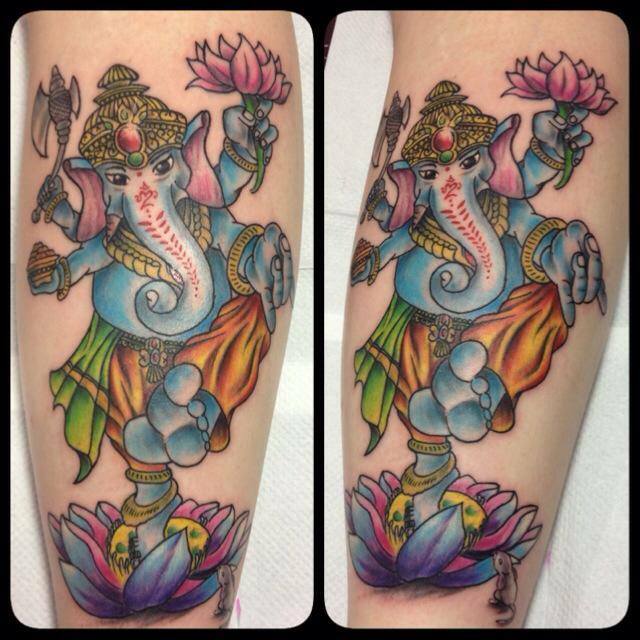 You might see different interpretations of him across religions or thanks to artistic license. 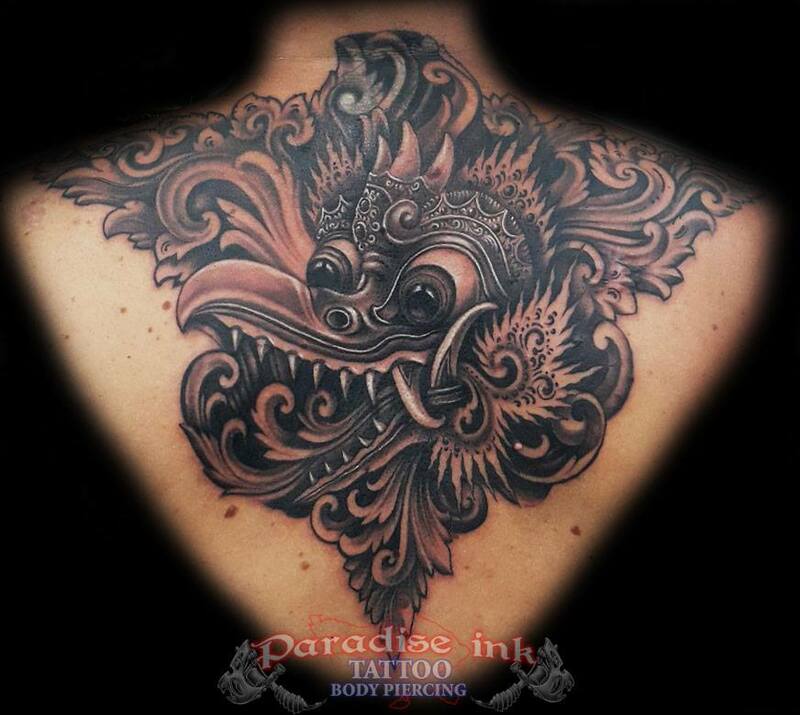 In Bali, Garuda is also called Paksi (right??). 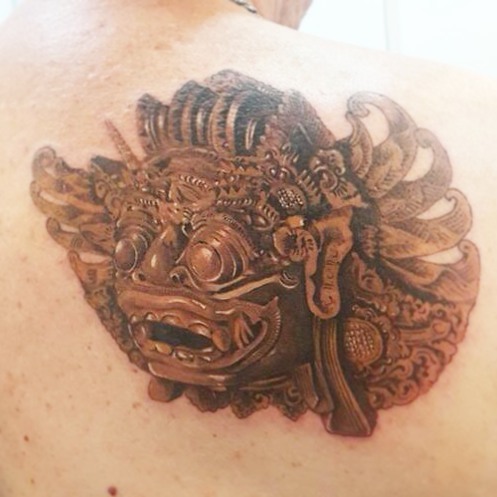 There is an ambitiously large statue of Garuda and Wisnu in progress at Bali’s GWK Cultural Park, and patung kayu (wood carvings) of Garuda are popular here. 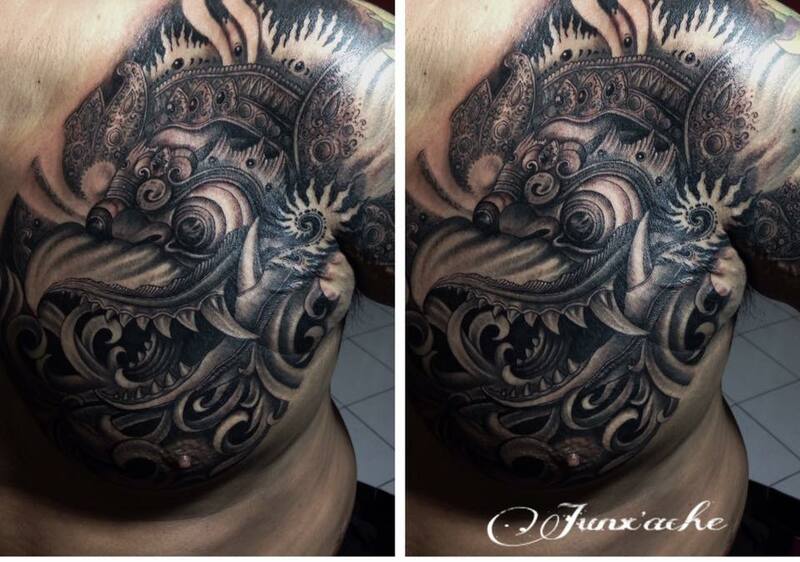 Two other less known Hindu bird figures which make great tattoo designs are Jatayu and Sampati (or Sempati in Indonesian), sons of Arjuna. 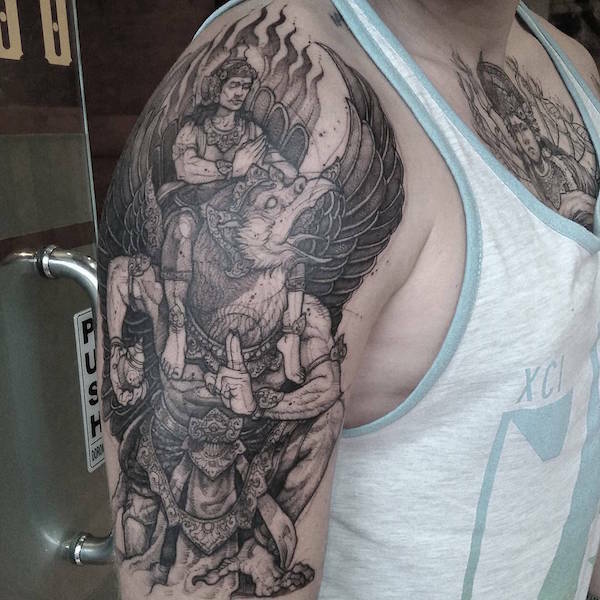 Jatayu looks a lot like Garuda, while Sampati looks like an eagle – legend has it, these two flew as high as the sun, and Sampati lost his wings as a child in the heroic act of protecting little brother Jatayu from being burned by the sun’s flames). 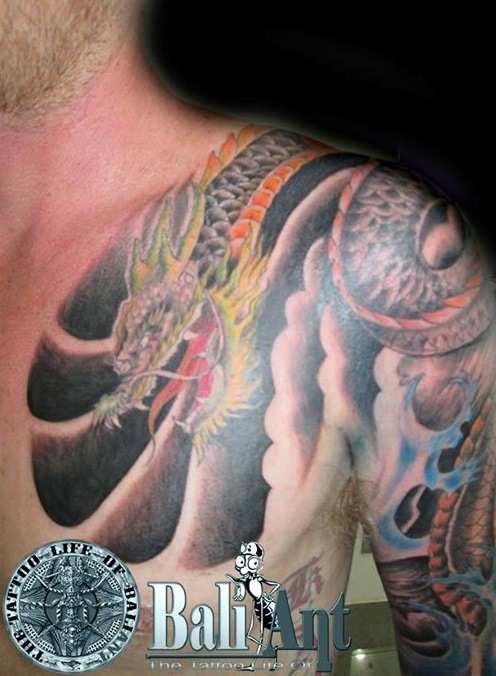 Naga are serpent spirits and guardians of the immortality elixir. 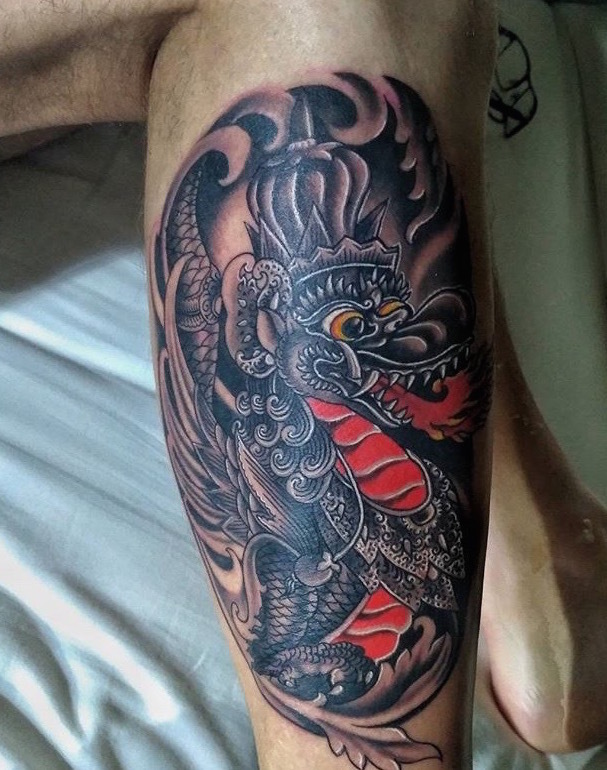 Some illustrations look like snakes while others are more like Chinese-style dragons or ancient sea serpents. 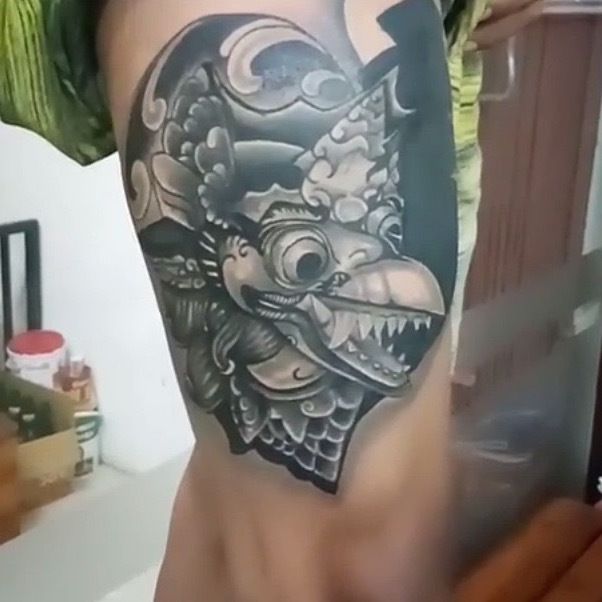 Naga are very much associated with water. 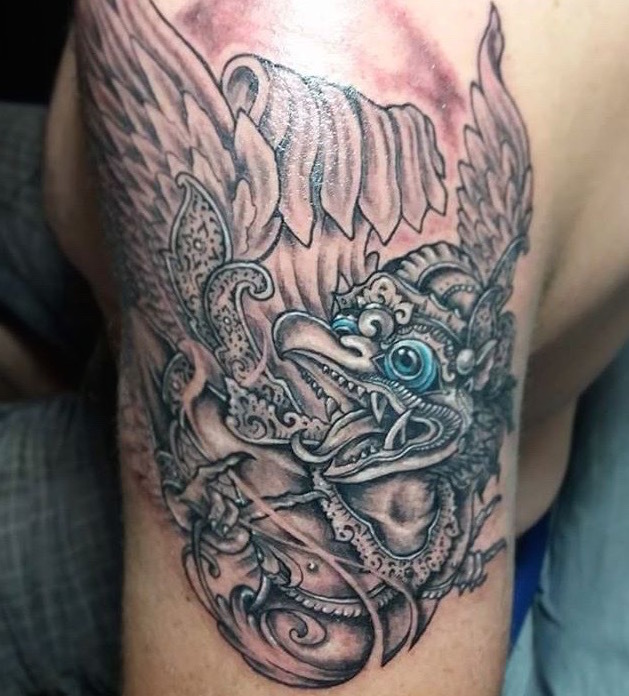 Slippery creatures, they can exhibit negative characteristics and are known to fight with Garuda (inspiration for a snake vs. eagle tattoo with an oriental twist?). 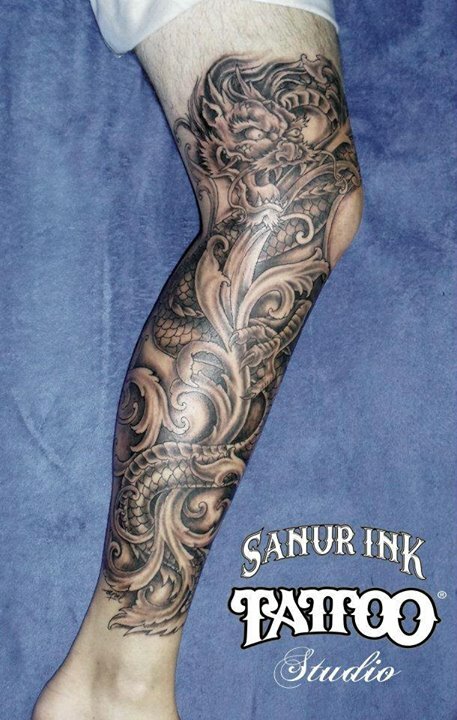 Nagini is the female form of the word (and the name of Lord Voldemort’s snake in the Harry Potter stories). 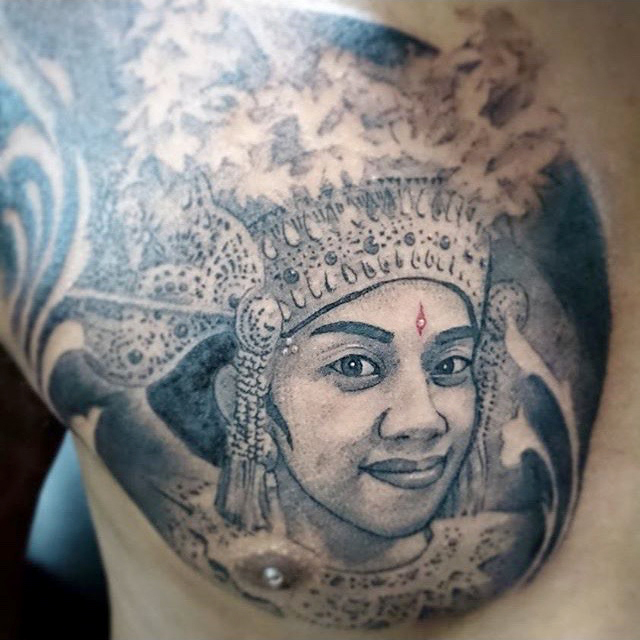 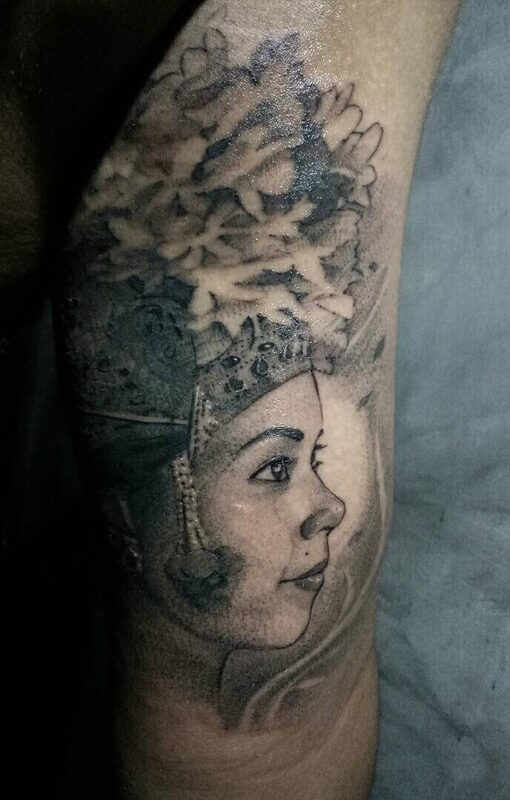 A Balinese dancer is a beautiful subject for a tattooed portrait. 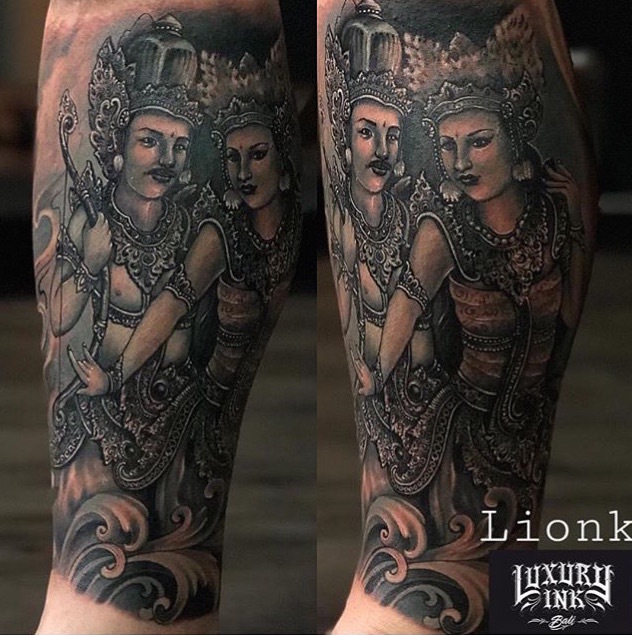 Our favorite tattoos of Balinese dancers capture the detail of the clothing and the performer’s calculated gestures with their eyes and hands which are characteristic of Balinese dances for religious ceremonies and storytelling. 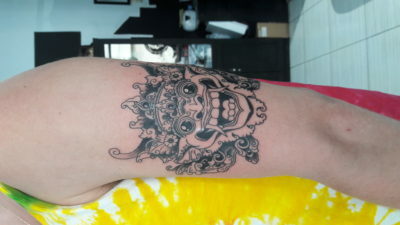 For the sacred Barong dance in Bali, dancers wear masks to become Barong and Rangda in a choreographed battle that represents good versus evil. 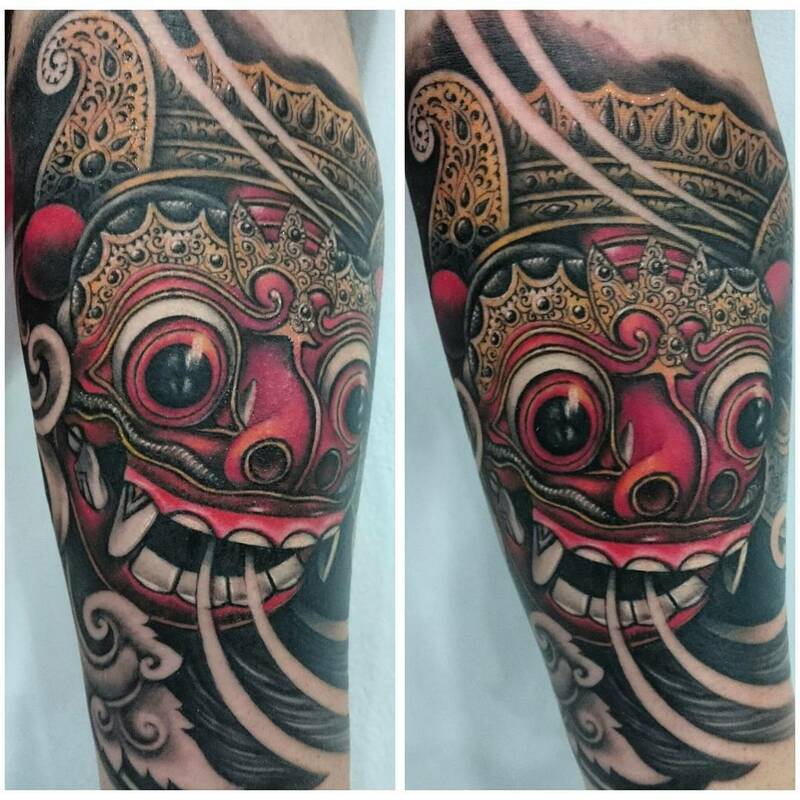 Barong is the guardian spirit of Bali – a very iconic mythical creature with large eyes is described as looking like a lion, a tiger, a bear or a dragon, and is usually red and gold. 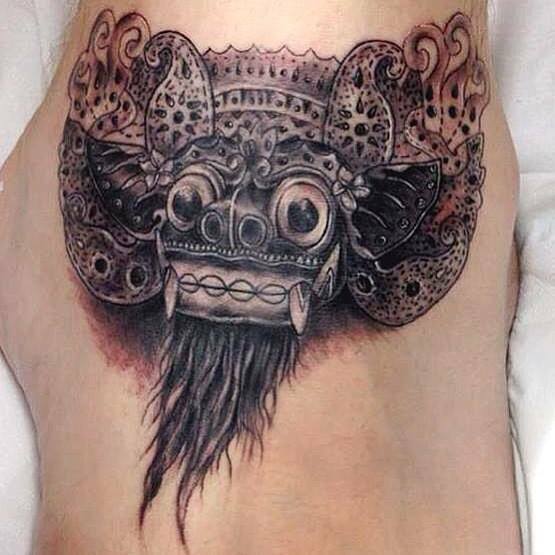 Rangda the evil witch spirit has fangs and a long tongue. 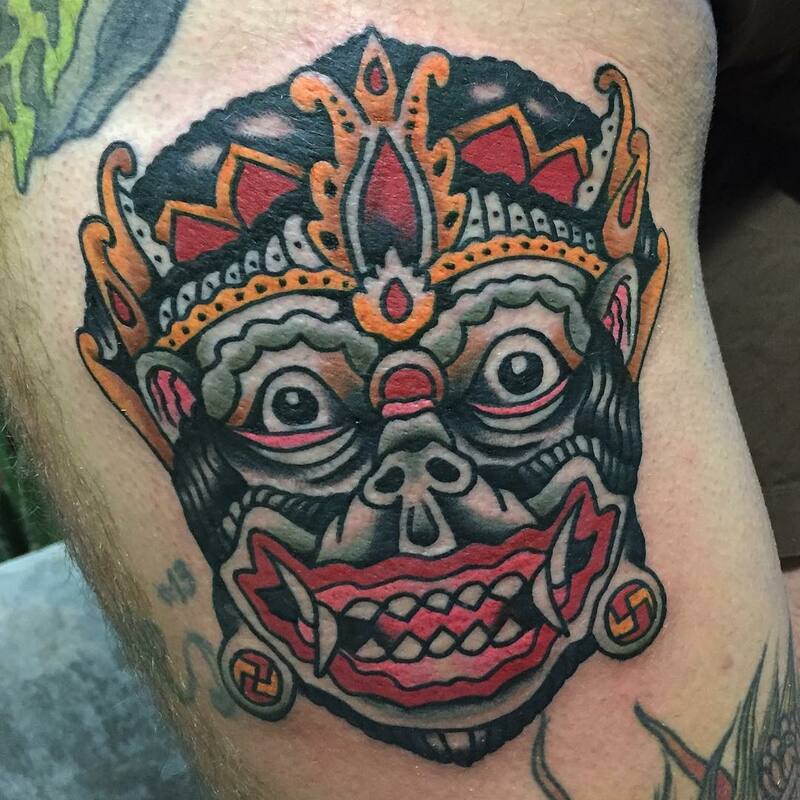 The elderly widow is the queen of the Leyaks – demonical cannibalistic flying heads. 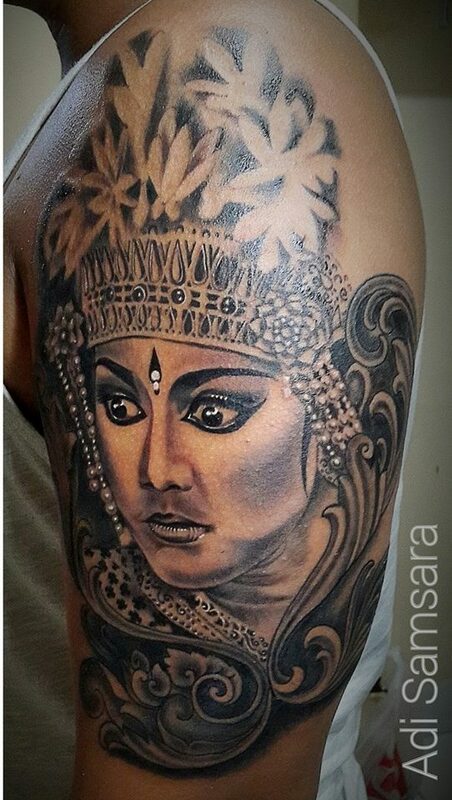 In some parts of Bali, she is also seen as a protector. 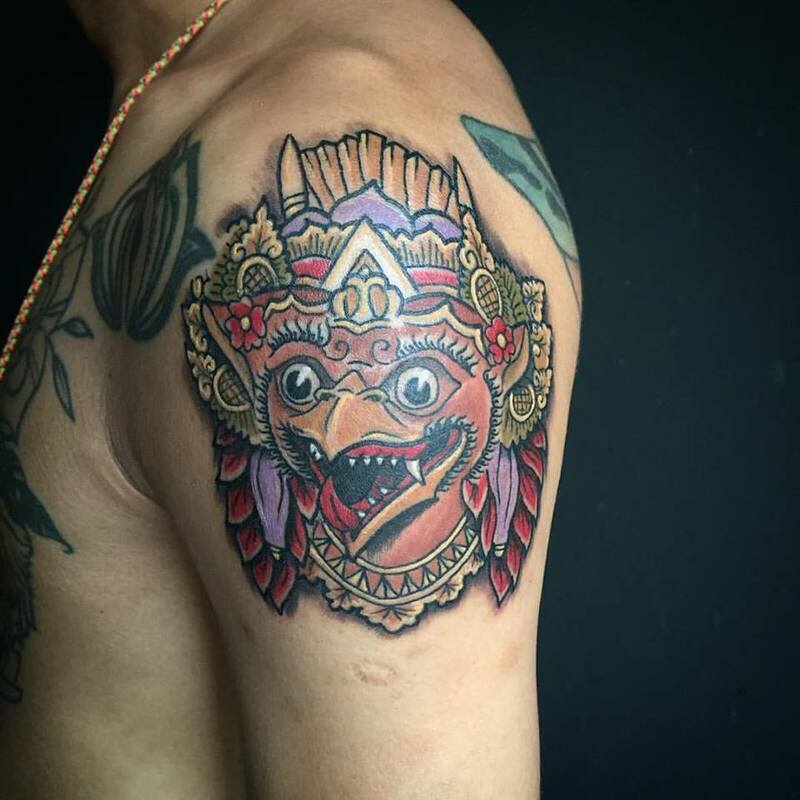 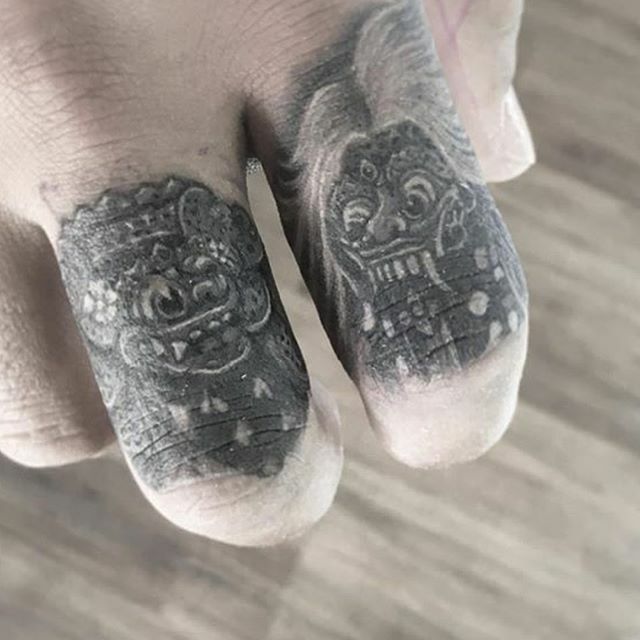 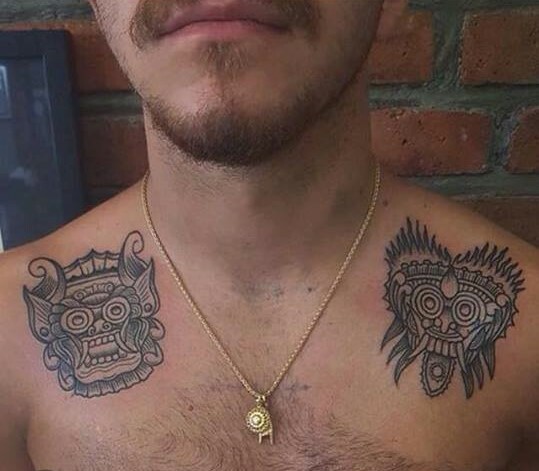 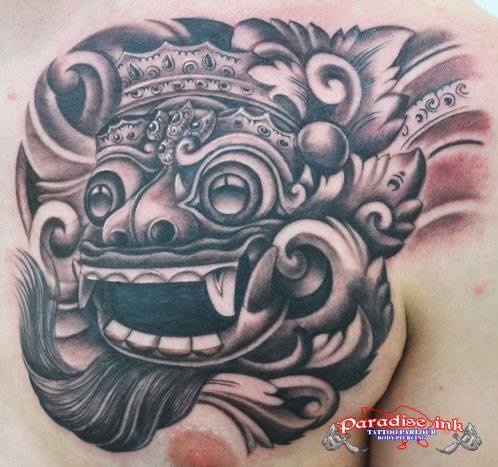 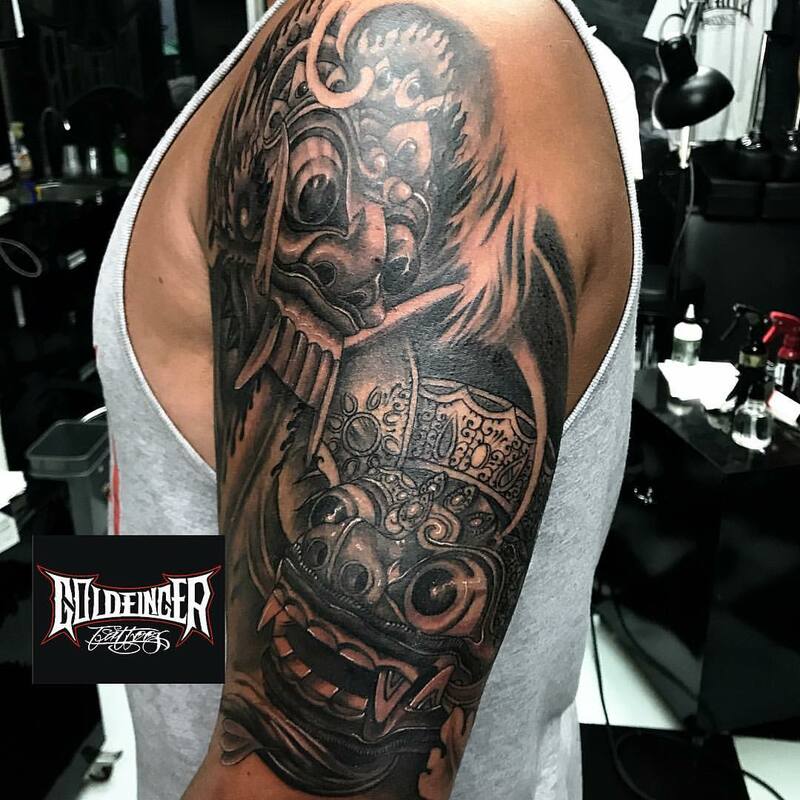 Although Barong is Bali’s most popular tattoo design, getting tattoos of Barong and Rangda together in a chest piece, back piece or sleeve has become more common. 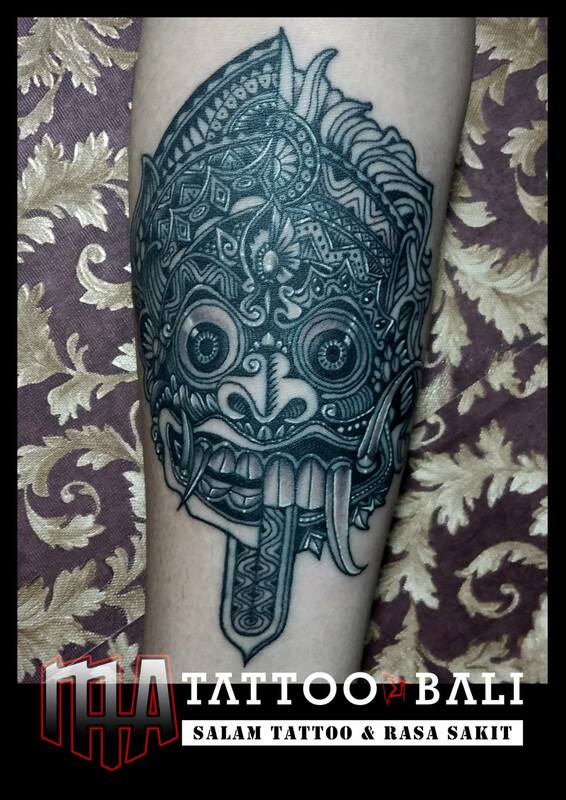 Alternatively, you can go for a more creative modern tattoo such as a half-Barong half-Rangda mask or the clever ambigram design. 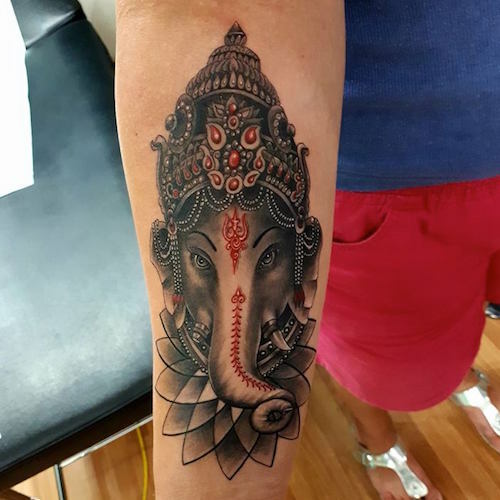 Lord Ganesh (Dewa Ganesha), with the head of an elephant and the body of a man with four arms, is one of the most well known Hindu gods, called the god of beginnings and remover of obstacles. 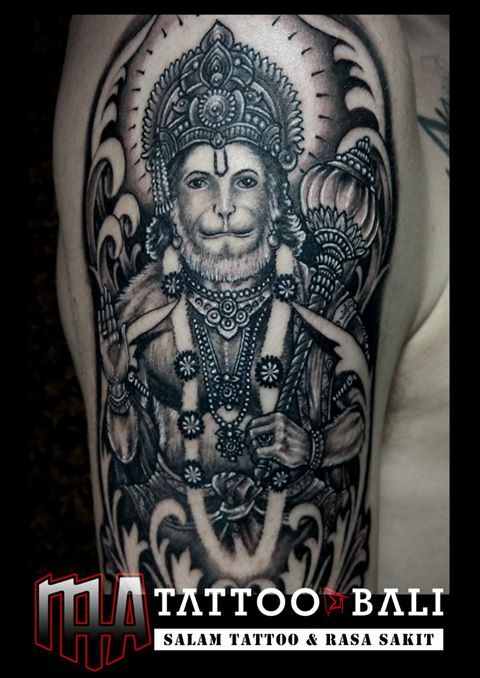 Hanuman (or Anoman) the Hindu monkey god symbolizes power and devotion. 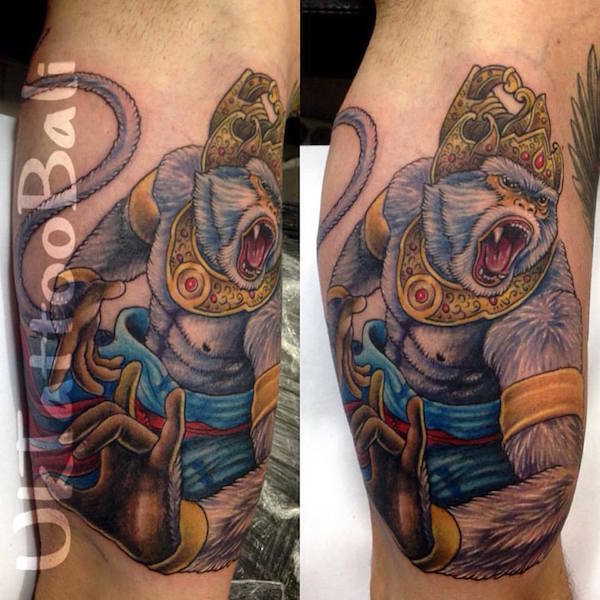 For whatever reason, Lord Hanuman is not as popular in Bali for tattoo designs compared to Garuda, Ganesh and Barong. 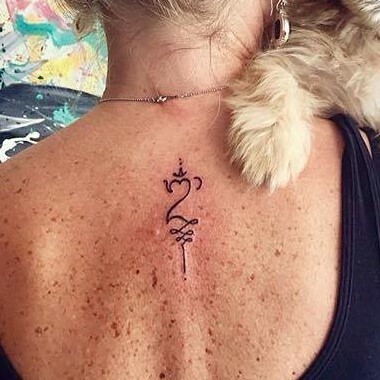 Thought so! 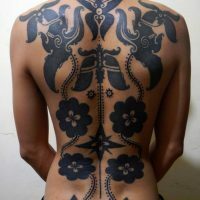 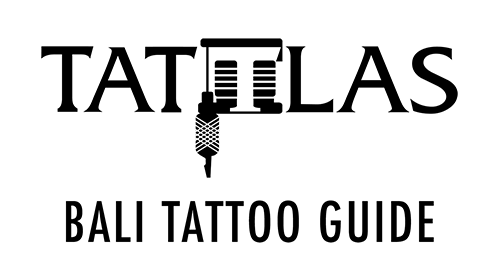 Don’t forget to take note of the tattoo styles you like most by visiting their portfolios and clicking the favorite heart. 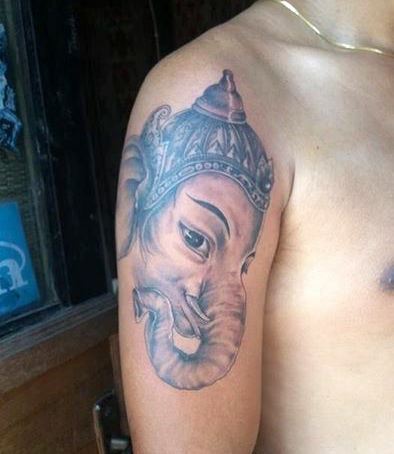 Please always research your tattoo ideas with various sources before getting inked. 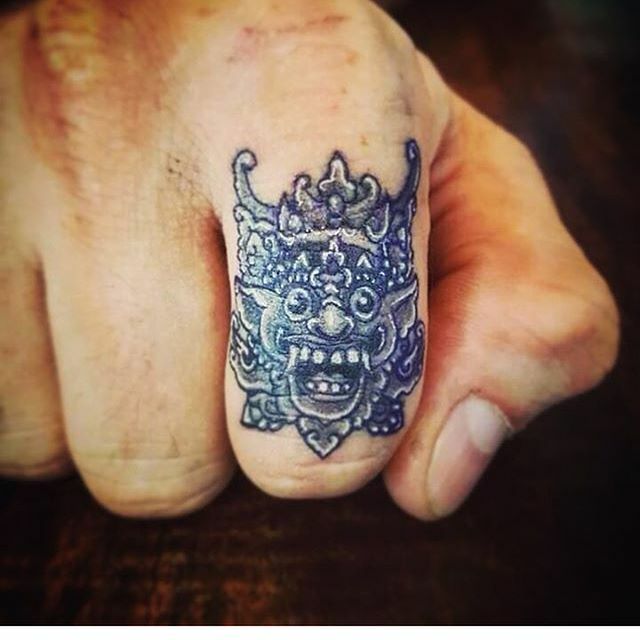 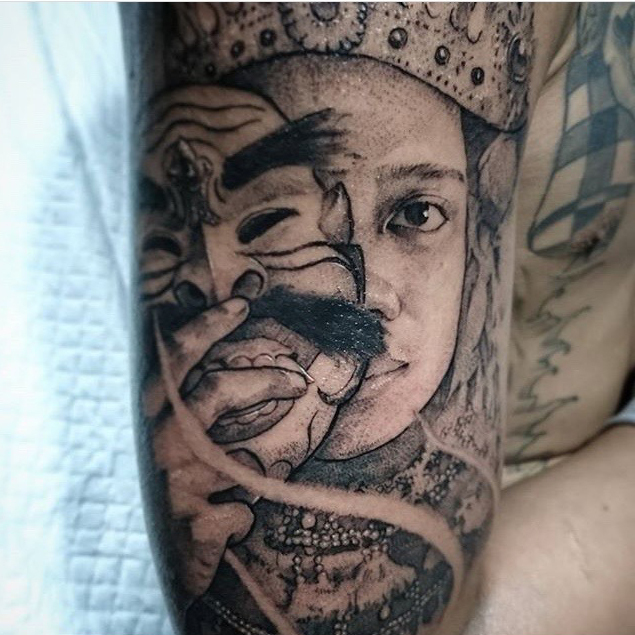 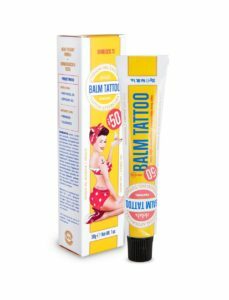 Do not expect Bali tattoo studio staff to know everything about Balinese tattoos, as many artists come from around Indonesia and other parts of the world. 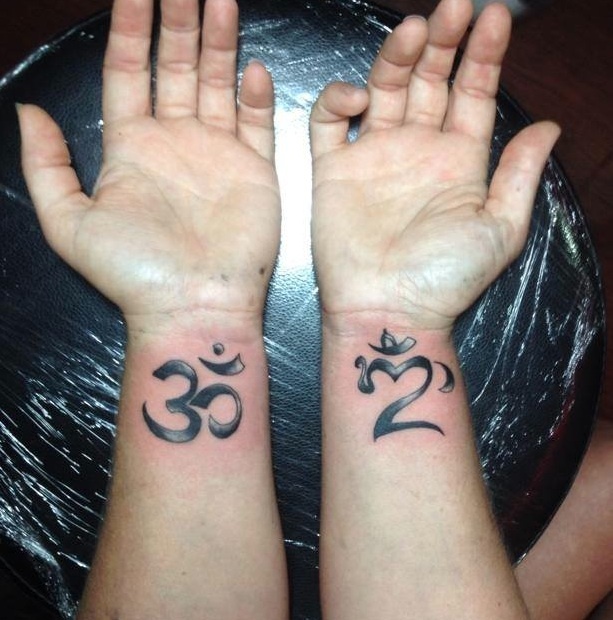 It is also wise to carefully consider the placement of your tattoo design, as some cultures associate feet and left hands with disrespect. 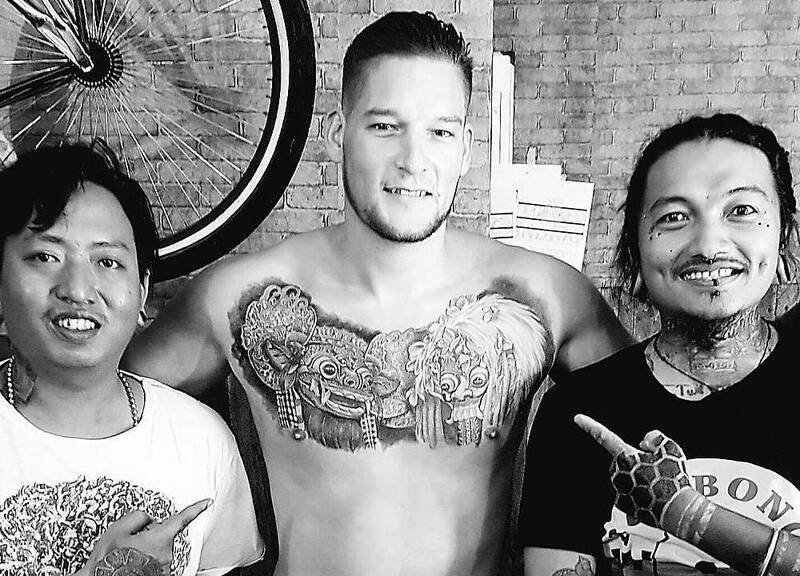 If you’re new here, this might be a good read: Getting Tattoos in Bali. 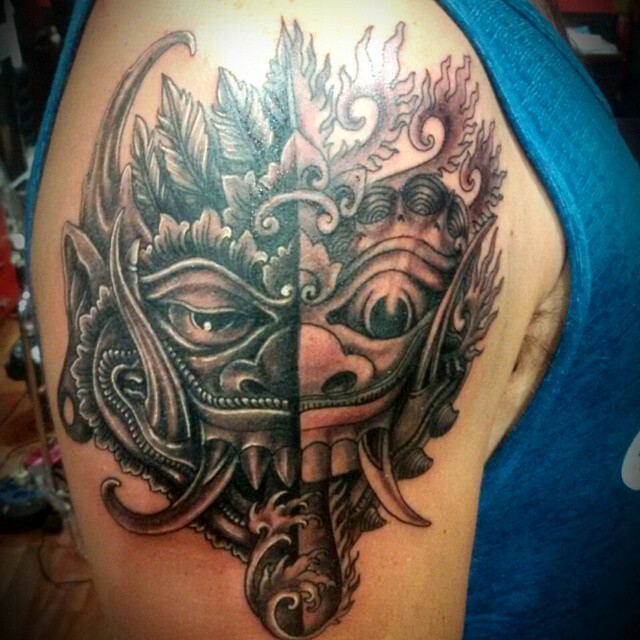 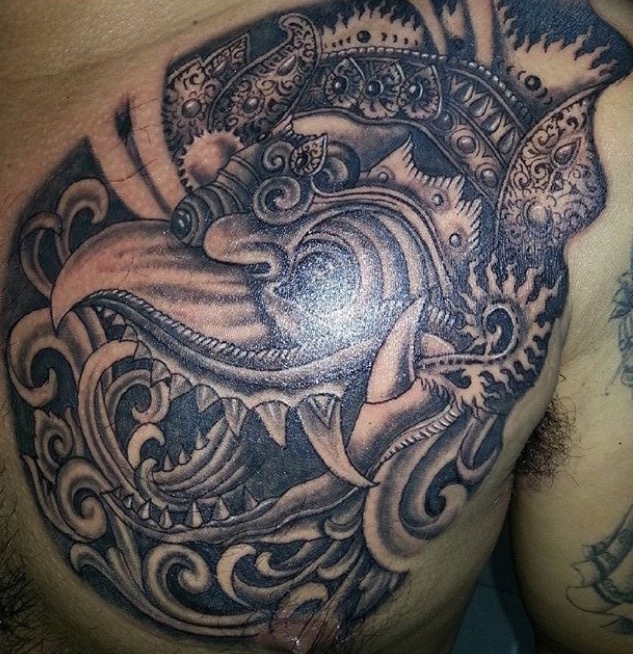 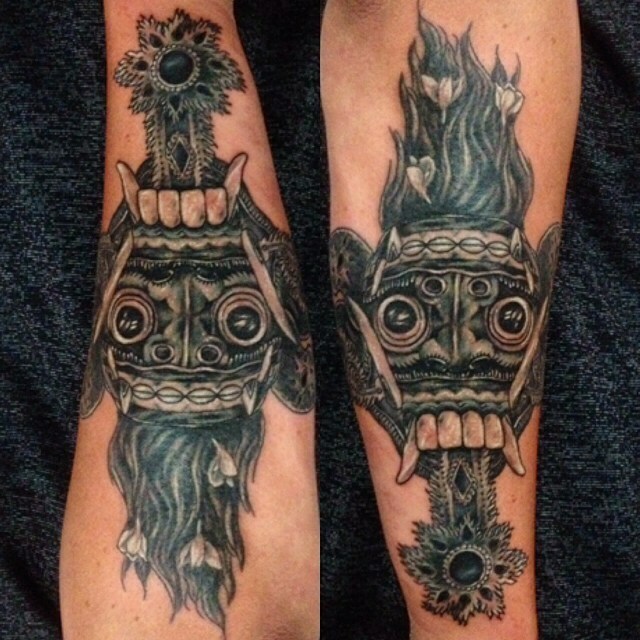 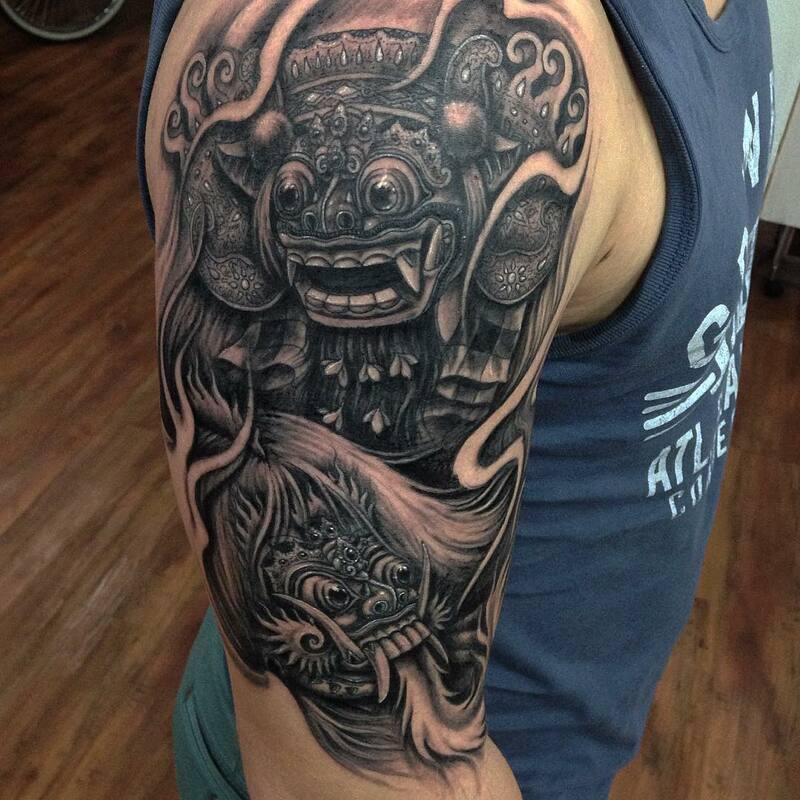 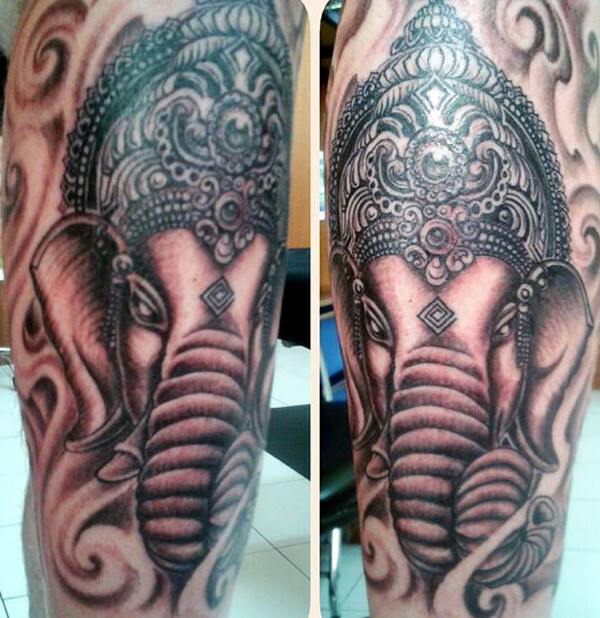 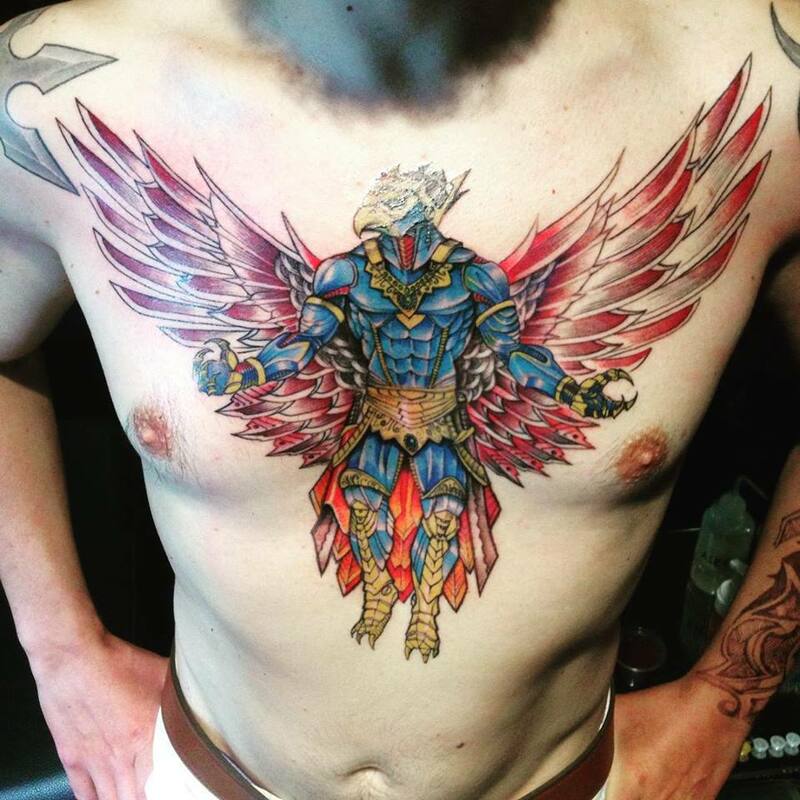 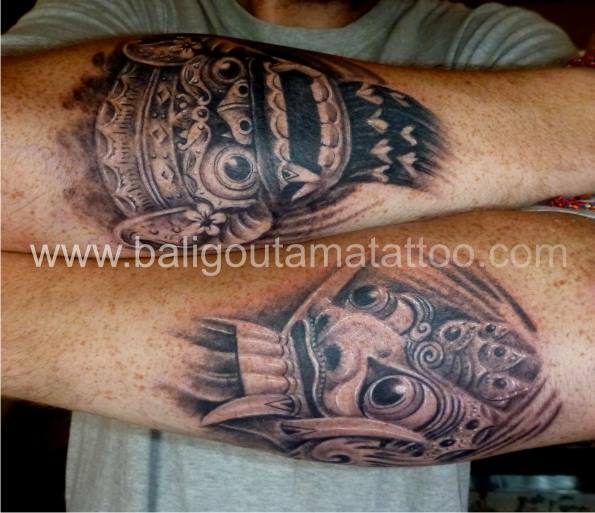 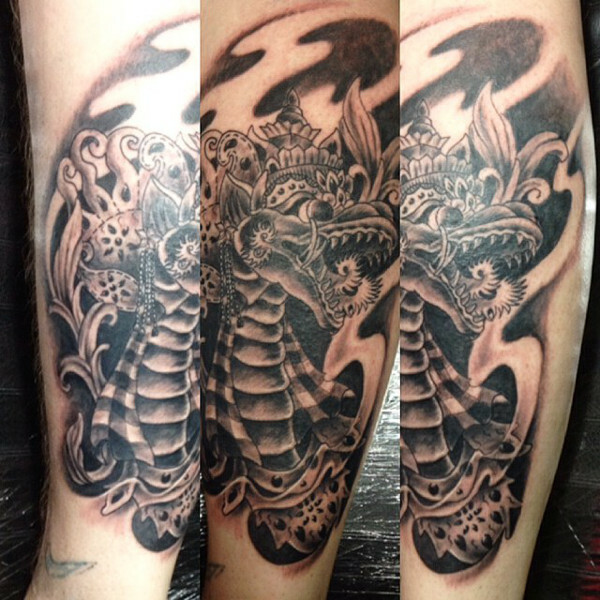 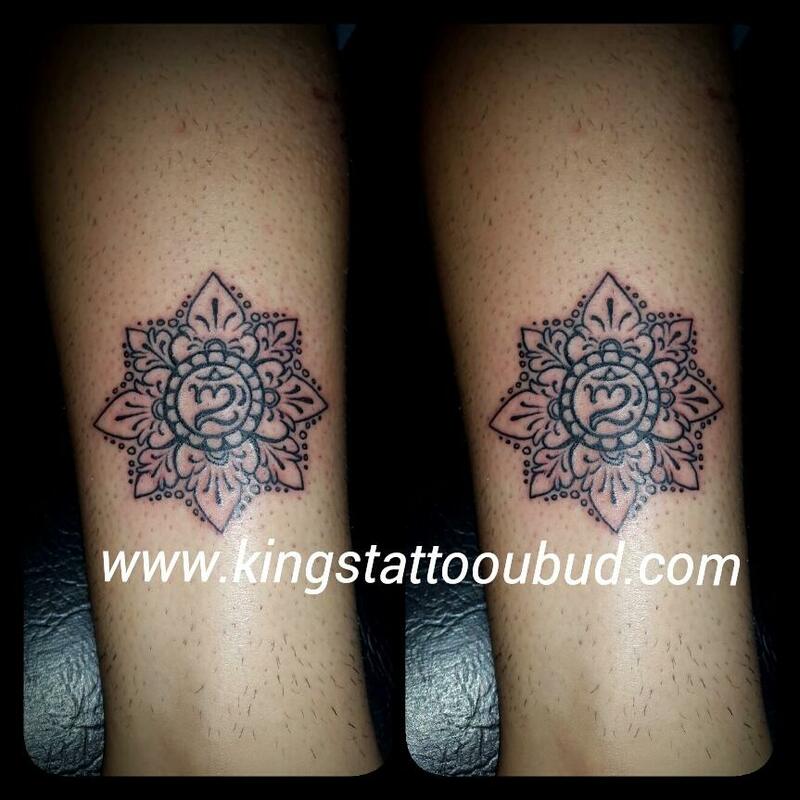 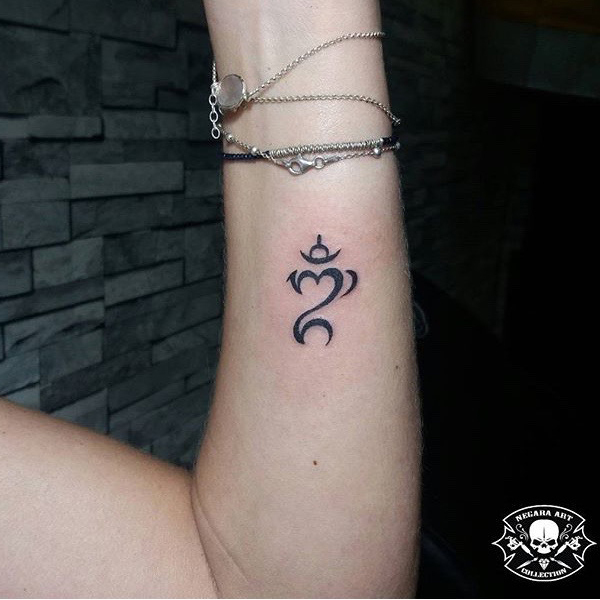 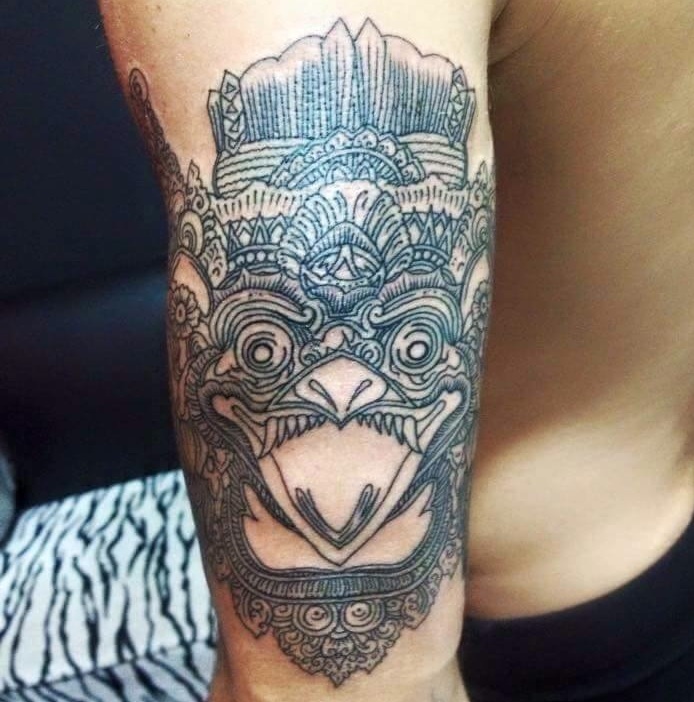 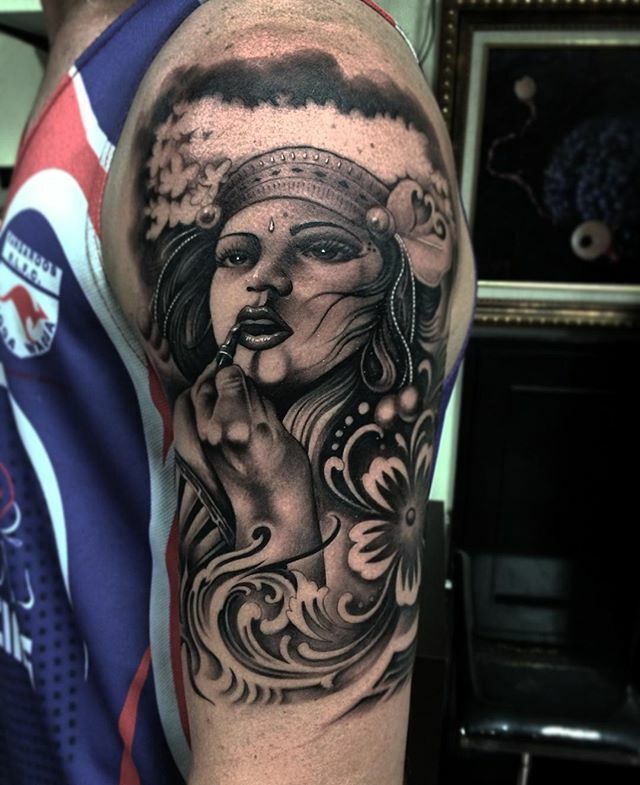 Otherwise, check out another #TattooGallery of Bali tattoos or browse Bali Tattoo Studios. 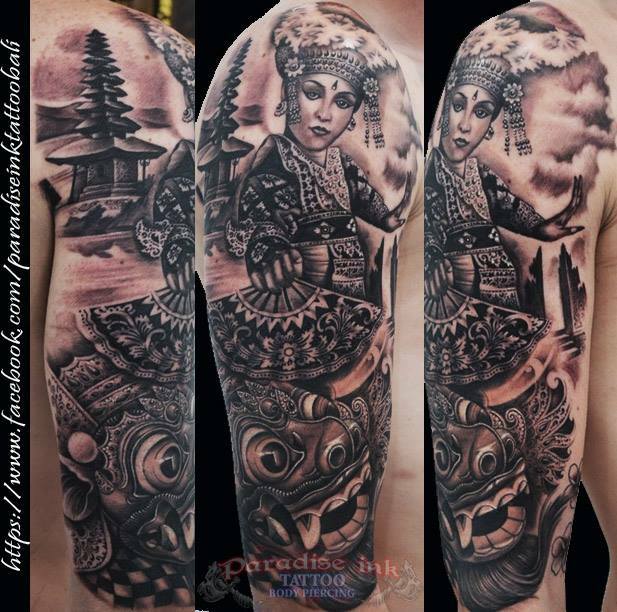 Add your comments or give us more Balinese tattoos in the section below. 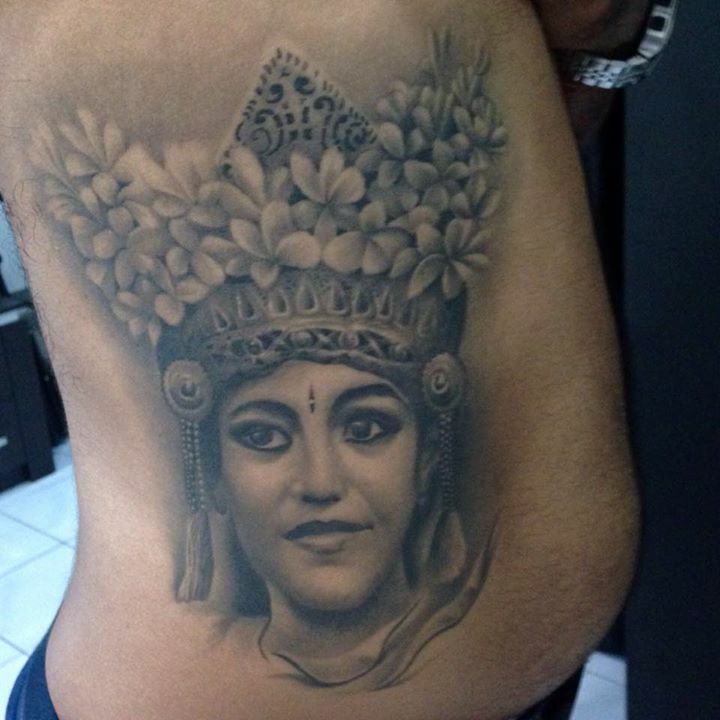 INK BY ARTISTS IN BALI ONLY. 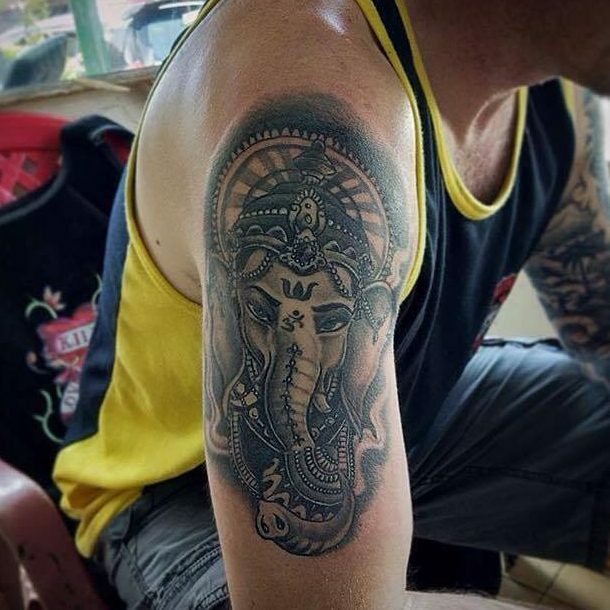 Last update: 25 Nov 2017.